If there's one thing that every member of the 2019 NASCAR Hall of Fame class has in common, it's iconic moments and major success at The Last Great Colosseum. The class of Jeff Gordon, Davey Allison, Alan Kulwicki, Jack Roush and Roger Penske combines for 259 wins (between both driver and team owner) as well as eight total Monster Energy NASCAR Cup Series championships. But the class truly shines bright at Bristol Motor Speedway. The five have been a part of 31 wins in some capacity and have played into some of Bristol's and NASCAR's most historical moments. Jeff Gordon shined on short tracks and that was no more evident than at The World's Fastest Half-Mile. The driver of the iconic No. 24 Chevrolet for Hendrick Motorsports had five wins at Bristol, including four in the Food City 500. The four-time Cup Series champion was especially known at BMS for his rivalry with fellow NASCAR Hall of Fame inductee Rusty Wallace. The pair were involved in two of the most legendary finishes at the half-mile short track when Gordon executed the bump-n-run on Wallace during the 1997 Food City 500 and the 2002 Night Race. The 2002 victory snapped a 31-race winless streak for Gordon and gave him his long-eluded August night win. 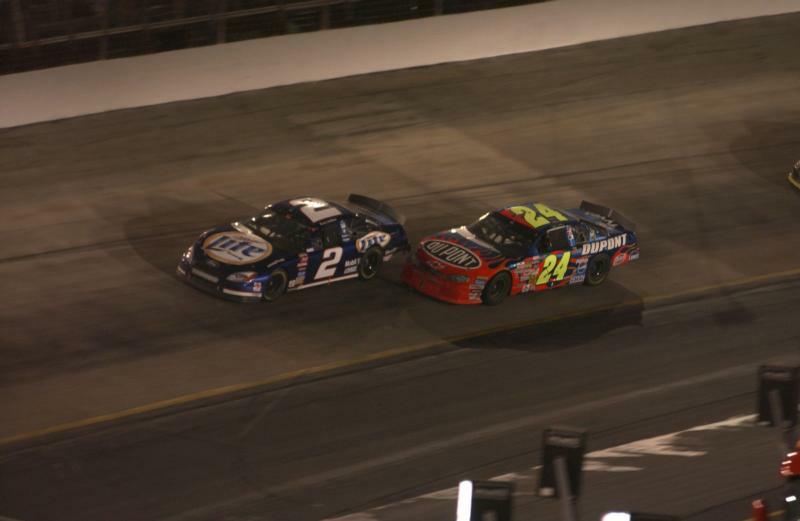 The roar of the crowd and the bumping and banging action under the lights has made the 2002 Gordon-Wallace battle one of the legendary finishes in NASCAR. Following his retirement, Gordon earned two additional Bristol honors. In 2015, BMS unveiled the Jeff Gordon Terrace, guaranteeing Gordon's name would continue to be a part of the legendary short track. In 2016, Gordon was added to Bristol's Legends Plaza, honoring the top names in Bristol history. Long tabbed as a future NASCAR star, Davey Allison lived up to his family name. The son of NASCAR legend Bobby Allison, Davey became one of NASCAR's superstars behind the wheel of the No. 28 for Robert Yates Racing. Allison picked up his first and only Bristol win during April 1990 when the Alabama native beat Mark Martin in a drag race photo finish. Allison beat Martin by eight inches in one of the closest finishes in NASCAR history at the time, and before the invention of electronic scoring. The superstar was also known for his battle with Darrell Waltrip in 1991 when the No. 28 and No. 17 collided. A disagreement on what happened ensued during the red flag that followed. Despite the tension, ultimate respect remained between the two competitors. Tragically, Allison would only compete in three more races at The Last Great Colosseum before passing away in a helicopter incident. Just like Allison, Alan Kulwicki was quickly on his way to NASCAR superstardom. The independent driver picked up his first Bristol win in August 1991 before claiming the 1992 Food City 500, Food City's first year of sponsoring the Spring race. The win in East Tennessee helped propel Kulwicki to the 1992 Cup Series championship. Sadly, Kulwicki would only race around the historic high banks once more when his plane crashed near Tri-Cities Regional Airport in nearby Blountville, Tenn. The driver of the No. 7 was on his way to the track from a sponsor appearance at Hooters when the plane went down. Despite the tragedy, the 1993 Food City 500 weekend continued on. Teams gathered to watch Kulwicki's hauler depart the Speedway, adorned with a black wreath on the grille. Race winner Rusty Wallace honored Kulwicki with the Polish Victory Lap, the signature celebration of Kulwicki. It was a fitting tribute to a top NASCAR star. Not to be forgotten, Kulwicki's name lives forever in Bristol with the Kulwicki Grandstand and Kulwicki Terrace, located between Turns 1 and 2. While not a driver, Jack Roush has experienced numerous highlights at Bristol Motor Speedway. Roush drivers have 11 wins at Thunder Valley with Mark Martin, Kurt Busch, Matt Kenseth and Carl Edwards representing the team owner affectionately known as "The Cat in the Hat". One of Bristol's best finishes occurred during a Roush win. During the 2008 Night Race, Edwards executed the bump-and-run on Kyle Busch to claim the win. Busch was not happy and attempted to rough Edwards up on the cool down lap. The Roush Racing driver was not going to let Busch get away with it and spun the Joe Gibbs Racing driver. The crowd went wild as Edwards performed his signature backflip following his dustup with Busch. Roger Penske's drivers have long been successful at Bristol Motor Speedway. Rusty Wallace, Kurt Busch, Brad Keselowski and Joey Logano have combined to win 12 races for "The Captain". Seven of Wallace's nine Bristol Cup wins came at the controls of the No. 2 Penske machine. One of Team Penske's proudest moments came at the 2000 Food City 500. Wallace picked up his 50th career win at the track. The achievement was fitting for Wallace, who earned his first career Cup win at Bristol in 1986, and for Penske who guided Wallace through some of his greatest moments at the Speedway. While all five members are etched in Bristol history, the exciting action at The Last Great Colosseum continues to this day. The upcoming Bass Pro Shops NRA Night Race weekend (Aug. 16-18) sees NASCAR's best battle under the lights at a track where sparks fly and tempers flare. Tickets for the Bass Pro Shops NRA Night Race are available starting at just $70 for adults and $10 for kids 12-and-under. To purchase tickets, call 423-BRISTOL or visit www.BristolTix.com.